If you’re an audiophile, you might be a fan of high resolution music and lossless audio formats. After all, no matter how good an MP3 track sounds, there will always be a difference, compared to its high-fidelity (Hi-Fi) FLAC version. Conventional audio formats like MP3, AAC, etc., use lossy compression, and thus not suitable for ripping audio CDs in their original quality. MP3 tracks are ripped only at 320 kbps (max quality). Comparatively, high fidelity audio CDs are recorded at 1411 kbps (16 bit, 44.1 kHz). There are some specific file formats available, such as PCM, WAV, AIFF, DSD, FLAC, ALAC, etc., which are ideal for storing high fidelity & high resolution audio. Some of these formats (like PCM, WAV, AIFF, DSD, etc.) do not use any compression, and hence known as uncompressed audio formats. On the other hand, formats like FLAC and ALAC, use lossless compression, and store high fidelity audio (without losing quality) at half of the original size, which makes them suitable for high fidelity audio playback. Not all media players are capable of playing lossless audio formats (FLAC, ALAC, WAV, AIFF, DSD, PCM, etc.). If you want to play a FLAC track on your computer, you have a couple of decent options, such as VLC Media Player, which is available for all major desktop operating systems. But these days, smartphones are usually preferred more as primary devices. 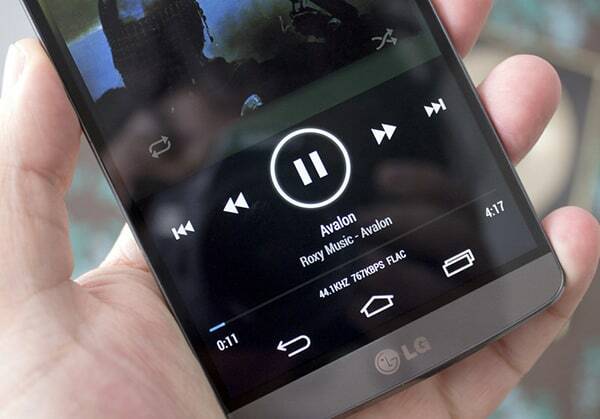 And most smartphones do not include native support for playing lossless audio formats. In this article, we’ll explore a few workarounds to play lossless audio (FLAC, ALAC, WAV, DSD, etc.) on iOS and Android. 3 Should you keep FLAC tracks on your smartphone? You might come across quite a few third party apps on the App Store, with lossless audio playback support. However, not all of them provide a good user experience. Moreover, some of these media players support only FLAC among many other popular formats. If you want a free third party app that supports various lossless audio formats, VLC is a good choice. But even though VLC includes support for various lossless audio formats, it’s basically a video player and might not be a suitable music player alternative. If you want a dedicated music player app with support for FLAC, WAV, DSD and other lossless formats, and don’t mind spending a few bucks, Vox is one app you might want to try. 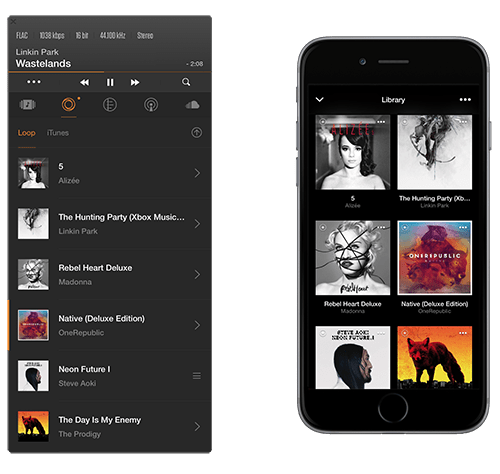 Vox is a multi-featured, lossless audio-supported media player app for iOS, with an intuitive dark UI. One of its most notable features is the unique 4 or 5-band parametric equalizer, which you can customize using four dynamic pivot points. And one thing about playing lossless audio is that, regardless of the equalizer setting, you’re bound to get clarity on all recorded frequencies across the entire spectrum. For example, a Bass Boosted equalizer setting will provide for greater thumps, but without compensating the mids and lows at the same time. You can directly access your iOS Music Library within Vox. Additionally, you can also import music tracks into Vox from other apps (via Open In) or from your computer, via iTunes File Transfer. Vox also integrates with third party services like Spotify or Soundcloud to expand your existing music collection. However, Spotify Integration is currently available only to Spotify Premium subscribers. Vox Media Player is available for download on the App Store for $3.99. In order to make lossless audio tracks playable inside the native iOS Music app, you need to convert the file to Apple Lossless format, import it to your iTunes Music Library and then sync with your iOS device. It’s way more complicated than having the track automatically converted losslessly, and transferred to your iOS device on the fly, with just a simple drag-n-drop action. Sounds too good to be true? Well, WALTR makes it possible. WALTR is a unique app, available on both Windows and Mac, that enables easy transfer of content from your computer to iOS device (iPhone, iPad, iPod Touch) by dragging the required files (music, videos, ringtones, ebooks) on your computer and dropping it onto the application window. WALTR then automatically copies them onto your iOS device, in a compatible format, available inside the respective native apps provided in iOS (Music for music files, Videos for video files, iBooks for ebooks and PDFs, while ringtones go into the appropriate section in iOS Settings). The latest version of WALTR, WALTR 2, even supports wireless transfers. As long as the iOS device and the computer running WALTR, is connected to the same WIFi network, WALTR 2 will automatically detect the device. Download and Install WALTR for Mac or Windows. Connect your iOS device to WALTR via USB or WiFi (WiFi support only available on WALTR 2). Drag and drop the lossless audio files (FLAC, ALAC, WAV, AIFF, DSD, etc.) from the computer onto WALTR’s application window. WALTR will now automatically convert the files to the supported lossless (ALAC) format and transfer them to your iOS Music Library. Once transfer is completed, search and play the recently transferred tracks in the native Music app on your iOS device. WALTR 2 is available for a free 14-day trial. After that, you need to purchase a license to continue using it. It costs $39.95 for a single license, $59.95 for a Double Pack and $89.95 for a Family Pack (5 licenses). But for 7labs readers, there’s an exclusive discount of 10% (up to 59%) on all WALTR 2 licenses. Alternatively, WALTR Original (without WiFi support and a few other features) is available at $29.95 for a single license, $49.95 for Double Pack and $79.95 for a Family Pack (5 licenses). 7labs readers get a special discount of 40% (up to 72%) on all WALTR Original licenses. Android users can use a suitable third party music player app that supports playback of lossless audio formats. Luckily, there are some popular music player apps that might just persuade you to replace the native music player that comes pre-installed on your device. Here, we’re going to explore a few of these options. PowerAmp is a power-packed Android Music Player that supports a wide variety of audio formats, including lossless ones like FLAC, ALAC, WAV, APE, AIFF, etc. It accompanies a 10-band equalizer that includes separate controls for bass and treble adjustments. The app also supports several customizations, such as skins and plugins. For advanced users, there’s lyrics support, including lyrics search via musiXmatch plugin, dynamic play queue, missing cover art download, OpenGL based cover art animation, advanced tag editor, and much more. PowerAmp is available as a free 14-day trial from Google Play Store. The full version is available as a separate purchase for $3.99. Google Play Store has a handful of music apps capable of playing lossless audio, with an almost similar set of features. Some of the mention-worthy apps include PlayerPro, Neutron, JetAudio, AIMP, etc. All of these players are quite decent in terms of their sound output and customizations. Both JetAudio and AIMP have ad-supported, limited-featured free version apps available on Google Play; while PlayerPro and Neutron include free 14-day trial. We’d recommend you to try out all of them, and then stick to the one which you find the most convenient. Should you keep FLAC tracks on your smartphone? FLAC is best for storing CD-quality (high fidelity) or high resolution (higher than 16-bit/44.1kHz) audio. And, you need a good pair of headphones or speakers, with high fidelity & dynamic range, in order to enjoy such lossless audio. Additionally, your ears should also be sensitive enough and well trained to pick up the minute differences in high fidelity sound. So, experiment with lossless formats, and play them using a good pair of headphones or speakers. Smartphones these days, ship with 64 GB, 128 GB and even 256 GB of onboard storage, so the bigger size of FLAC files shouldn’t be much of a problem. But then again, do ensure that the DAC chip on your smartphone is also capable of high resolution audio output. If you feel that the quality difference is significant enough to compensate for its larger size, go ahead and build your own lossless collection in your smartphone. Ultimately, it’s also about a self satisfaction you get from knowing that you’re listening to the best quality of music available around.